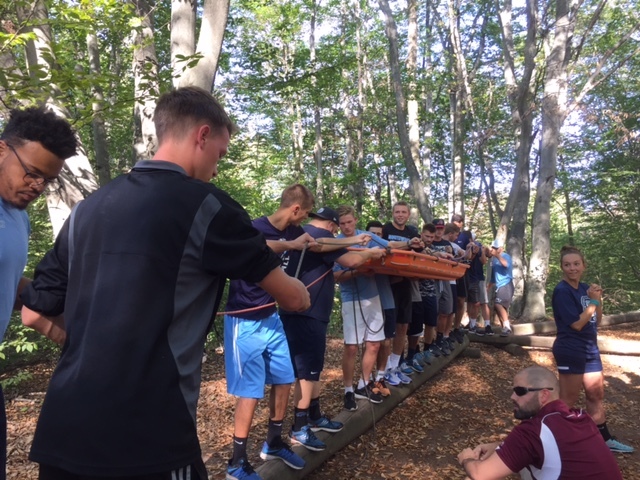 Thirty-five Northwood University student-athletes took part in a one-day leadership retreat at Eagle Village Retreat Center in Hersey, Michigan, Representatives from each team were present. We met up with Paul Evans, a student athlete, who attended and asked them a few questions. This is what they had to say! Operations and Supply Chain Management, currently I am attending the Devos Graduate School of Management. What teams and organizations are you involved with on campus? I am part of the Track and field team and I am also involved with the Student Athlete Advisory Committee. How did you get involved with this opportunity? To be involved with the leadership camp you were recognized as a leader on your sports team. What were some of the most important things you learned during this experience? The biggest take away for me from leadership camp is probably the concept E+R=O. The E stands for event, the R stands for response and the O stands for outcome. What the equation tell us is that an event can happen good or bad and what matters is how we respond to it. How we respond to that event is what our outcome will be. Other takeaways is being more positive, recognizing my weaknesses as a leader and how to make those my strengths. How will you apply this experience to your sport, education and career? I will apply the ERO equation in all three aspects of my life. After the leadership camp I have the metal tools necessary to tackle any event that may happen to me in my life. In my sport if I am having a big practice or a meet I won’t let that effect my outcome, because I know can recognize that and respond in a positive way. In my education if I get a bad grade or if I am stressing out with my school work I can respond in the correct manner in order to have an outcome that is positive. In my career I can also use the equation and lessons learned to benefit the organization that I will be a part of. Being positive, bringing in results and helping my coworkers achieve their goals is the benefit and the outcome that the leadership camp would help me achieve. Why do you think it is important for student athletes to have this type of experience while they are in school? As a student athlete you can get caught up in your practice and sometimes not realize how much you effect your teammates and other student athletes. Learning these skills when you are a young student athlete will help you use them toward your personal and professional career. As a student athlete these skills are important to have, however we learned that you have to separate your athlete life, from your personal life. In the future you can relate this to separate your work life from your personal life. Having these skills on hand to use will make us better student athletes and business professionals. What was the highlight of the experience for you? The highlight of the experience for me was definitely the high ropes course. Not only did the course test our composure, but it also showed us all our mental toughness in stressful situations. The camp itself helps you as a student athlete, however continuing to recognize how you can be a better leader every day is what will make all of our teams better. Recognizing our own strengths and weaknesses is just one step in the right direction. As student athletes we have to work continuously every day at our own mental battles while also assisting others. This experience has opened up my eyes to a new approach to lead others, and I am thankful for the opportunity to be a part of something so beneficial.